Among the few vacant lots remaining in Murray Hill, 685 First Avenue, between East 39th and 40th Streets, was one of the largest before permits were filed back in August of 2015. In May of 2016, the first renderings for the building were released, and by January of this year, construction was several floors above street level. 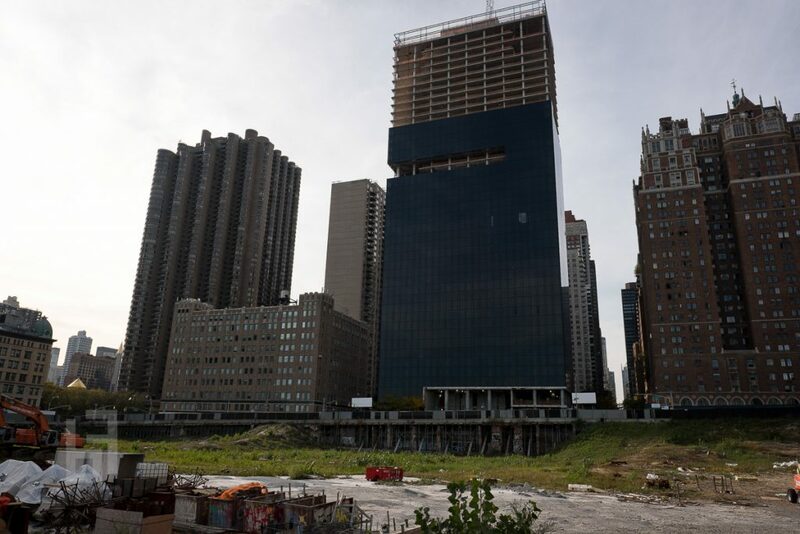 Now, the latest photos from 5B Films show that work has topped-out, and the facade is closing in on the upper levels, as the 42-story tower approaches completion. Sheldon Solow is the site’s developer, and among his other projects at the moment, YIMBY recently reported on headway being made at 7 West 57th Street, up in Midtown. 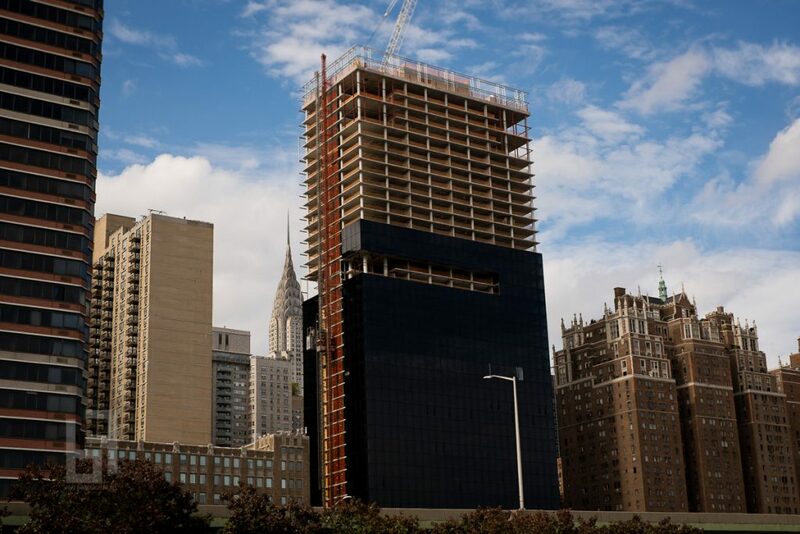 Solow’s penchant for black-slab architecture appears to extend far and wide, though in 685 First Avenue’s case, the tower profile is especially impressive, with the envelope enclosing 596 total dwelling units. Those will spread across about 800,000 square feet of space, with another 10,000 square feet of ground-floor retail rounding out the base. The 448 apartments will span floors 3 through 27, while 142 condos will occupy floors 28 through 42. 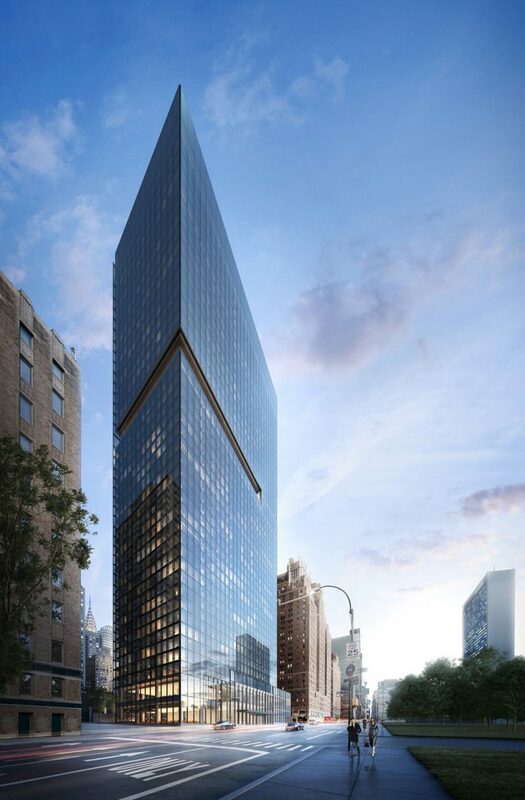 Richard Meier & Partners is behind the design for the tower, which bears striking semblance to Two Sutton Place North, also faced in black glass, which opened a few years ago, across from its twin One Sutton Place North. In the case of 685 First Avenue, a cut-out near the mid-section will offer a minor mark of minimal distinction. While the design is somewhat bland, the inclusion of so many apartments atop the retail space will help activate the formerly desolate block. More importantly, new towers will eventually rise across the street for the Con Ed redevelopment, so 685 First Avenue is eventually going to have several new neighbors that extend the area’s urban fabric one block farther east. With glass well over halfway up the exterior and rising at the rate of one floor per week, interior work should soon begin, and signage indicates completion of the tower is expected by the end of next year. 4 Comments on "Solow’s 685 First Avenue Nearing Completion, Murray Hill"
Yes or No: When you see progress showing. You have a talent for diplomatic understatement and/pr lying. Bad day at black rock is more like it. 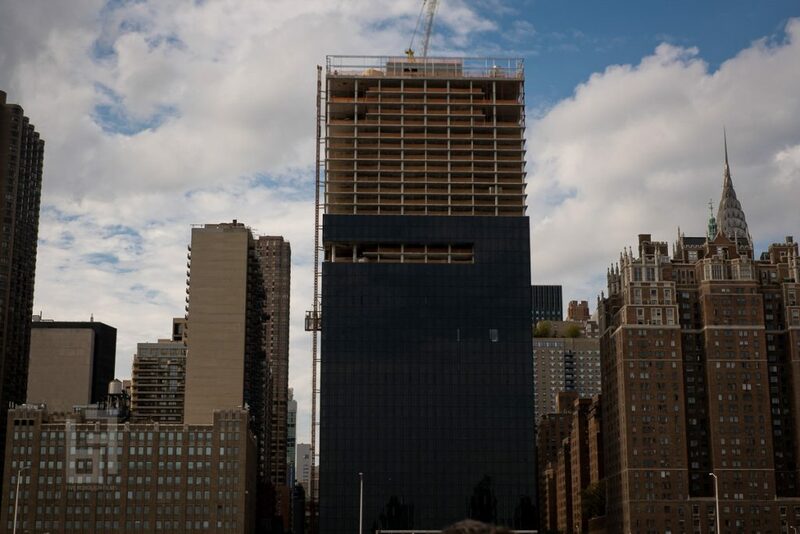 If the building is topped out, why is there no flag flying? Perhaps the building is too ugly? Wow! Impressive. I would love to live in this building.